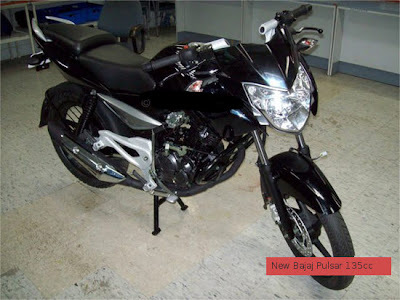 A new and stylish Bajaj Pulsar, powered by a 135cc engine, is ready to hit Indian roads on 9th December, 2009. The new Bajaj Pulsar might loaded with a number of sporty features and technology. For instance, the Bajaj Pulsar 135 will be equipped with rear Nitrox suspension, dotted tail light, air scoops, sharp and compact turn indicators, tail mounted number plate, small sliced muffler, split seat and grab bars, digital meters, black matt finish mag alloy wheels and revamped headlamp etc. A good number of features are borrowed from Bajaj XCD135, Bajaj Discover 135 and Bajaj XCD Sprint (it was showcased in Auto Expo 2008 but commercial launch). Interestingly, the regular fuel tank in Pulsar range is not fitted in the new Bajaj Pulsar, instead it has Bajaj Discover 135' like tank. Moreover, the tail side is designed to give it much sporty looks. The rear number plate is fitted mounted on tail piece and rear fender's job is done by a tyre hugger. Though the company used the engine of Bajaj XCD 135, but you can expect more power and torque from the same mill this time. According to inital reports, it might be priced between Rs 55-60,000. Bajaj Auto launched Bajaj Pulsar bikes with Bajaj Pulsar 150, Bajaj Pulsar 180 and Bajaj Pulsar 220cc engine in India. The bike will have to face fierce competition from TVS Apache, Honda CBF Stunner and Yamaha Gladitor.